A Littlehampton mother has thanked St Richard's Hospital for a 'fantastic job' after they saved her daughter's lip which was bitten by a dog. 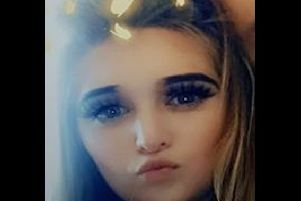 Charlie Coomber was taking her 11-month-old daughter Ella-Rose Tizzard out for an afternoon walk in her pram in Waterlane Park in Water Lane, Wick, when a black and white border collie jumped up and bit her daughter in the face, cutting open her lip. After the attack, which happened at around 1pm on October 30, the worried mum took her daughter to The Park Surgery in St Floras Road, Littlehampton, to see if they could help. She said: "As she only cried for a few minutes we thought it might have been superficial." She said staff there were 'very helpful' and sent them straight to Worthing Hospital, who examined Ella-Rose and then passed them over to St Richard's Hospital in Chichester as they had specialist doctors that could give her daughter the specific care she needed. Doctors at St Richard's gave Charlie the option to stay in overnight and put Ella-Rose on an antibiotic drip - but she chose to take her daughter home to Littlehampton with oral antibiotics, which would have the same effect. She said: "I thought she had been through enough that day and I didn’t want her to have to stay somewhere unfamiliar, so I took her home for the night." Early the next day, Charlie took her daughter back to St Richard's to have surgery on her lip. Charlie praised the care her daughter received. She said: "They put her to sleep and gave her wound a good clean out and did a fantastic job of stitching her lip line back to her lip. They were all so helpful and very accommodating." After the operation, Ella-Rose finished a week's worth of antibiotics and was able to eat and drink - which was a relief to her mother. She said: "She has done amazingly for someone so young; the thought of it haunts me so I just want to forget the whole situation. Fortunately she’s too young to remember." Sussex Police said the dog was not on a leash, and it was not clear if the owner was nearby. They have been seeking a man in his seventies who was in the park at the time and may have seen what happened. Charlie warned dog owners to keep an eye on their pets. She said: "I would urge people to never be too trusting with any pets. I hear too often that this dog or that dog would never do anything like that, but these animals can turn at any point. "This dog didn’t bark or growl; there was no warning." If you have any information about the incident, call the police on 101, quoting serial 921 of 31/10.